Use or disseminate any misleading email addresses, false or forged headers or identifiers or otherwise manipulate email addresses or web links in order to disguise the origin of content transmitted through this website. 4. Linking to this Website. You may link to any content on this website. If you are interested in reprinting, republishing or distributing content from VoteRiders, please contact VoteRiders to obtain written permission. As between you and VoteRiders (unless otherwise provided in the Terms and excluding any User Content [as defined below] that you submit), VoteRiders or its licensors solely own all right, title and interest, perpetually in all media throughout the world, in and to all content on this website, including without limitation all video, text, graphics, user interfaces, visual interfaces, photographs, moving images, illustrations, files, trademarks, logos, service marks, artwork, computer code, design, structure, selection, coordination, “look and feel” and arrangement of such content, and all elements of all of the foregoing. This content is protected by copyright, patent, trademark, trade dress, trade secret, moral rights and/or other intellectual-property laws. VoteRiders encourages you and other users to contribute content to this website, including without limitation videos and textual narratives that share your voting and voter ID stories and any associated comments (“User Content”). When you view User Content and any comments submitted by other users, keep in mind that such User Content may not necessarily represent your own view or the view of VoteRiders. 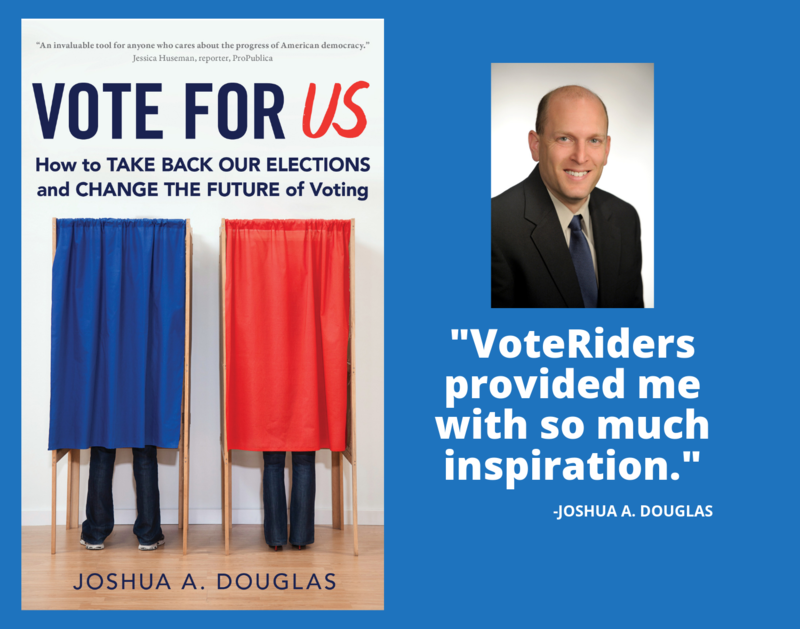 While VoteRiders encourages User Content that is supportive of and helpful to ensuring that eligible citizens can vote, through your use of the Services you may be exposed to User Content that you may find offensive, objectionable, harmful, inaccurate or deceptive. You assume all risks of such exposure. You understand that when you submit User Content, you are granting VoteRiders a license to display the User Content in connection with the Services or otherwise as set forth in these Terms; and, whether or not your User Content is published on the website, VoteRiders makes no representation of confidentiality or anonymity of any kind with respect to your User Content. To the extent that your video or other User Content conveys any person’s or entity’s name, likeness or other identifying information, you understand and agree that this information may be displayed on the VoteRiders website and otherwise as contemplated in these Terms. Accordingly, please review your User Content carefully prior to submittal to ensure it contains no information that any identifiable person or entity is not comfortable sharing. In connection with any User Content you submit, you affirm, represent, and/or warrant that: (i) you own or have the necessary licenses, rights, consents, and permissions to use and authorize VoteRiders to use all patent, trademark, trade secret, copyright or other proprietary rights in and to any and all User Content to enable inclusion and use of the User Content in the manner contemplated by VoteRiders and these Terms; (ii) you have the written consent, release and/or permission of each and every identifiable individual person in the User Content to use the name or likeness of each and every such identifiable individual person to enable inclusion and use of the User Content in the manner contemplated by VoteRiders and these Terms; and (iii) it complies with these Terms. You understand that all User Content is the sole responsibility of the person who transmits or posts that User Content. This means that you, and not VoteRiders, are entirely and solely responsible for all User Content that you transmit or post and for the consequences of VoteRiders using such User Content as contemplated by these Terms. VoteRiders reserves the right to monitor User Content and to remove or decline to post any User Content at any time, for any reason (or for no reason), without notice and at VoteRiders’ sole and absolute discretion, including without limitation if VoteRiders determines that User Content is inappropriate or fails to comply with these Terms. VoteRiders has no responsibility for the backup of any of any User Content or any lost data resulting from the use, operation or discontinuation of any aspect of the Services. Unless specifically requested, VoteRiders does not wish to receive any confidential, proprietary or trade secret information from you (including on the website). Accordingly, if you send VoteRiders any information or creative works, including without limitation idea submittals, suggestions, business plans, concepts or demos in any media including photographs, graphics, audiovisual media or other material (“Submitted Material”), you grant VoteRiders a royalty-free, unrestricted, worldwide, perpetual, irrevocable, non-exclusive, and fully transferrable, assignable and sub-licensable right and license to use, copy, reproduce, modify, adapt, edit (including combine any element of the Submitted Material with any other element(s) and content including User Content or Submitted Material of others), print, publish, translate, create derivative works from, create collective works from, and distribute, perform, display, license and sublicense (through multiple levels) the Submitted Material in any media now known or hereafter invented, including for commercial purposes. If you send VoteRiders any Submitted Material, you also warrant that the Submitted Material is not confidential or secret and that the Submitted Material is owned entirely by you. If you send VoteRiders any Submitted Material, you warrant that you have all rights necessary (including without limitation rights of privacy and publicity) to authorize VoteRiders to use Submitted Material as permitted by these Terms. You agree to indemnify and defend VoteRiders and its affiliates, if any, and each of their respective partners, officers, directors, employees, representatives and agents, against, and to hold each of them harmless from, any and all claims, losses, damages, fines, penalties or other liabilities (including attorney's fees) in any way associated with or arising out of: (i) your use of and/or access to the Services; (ii) your violation of any of any of these Terms; and (iii) your violation of any third-party right, including without limitation any copyright, trademark, trade secret, or privacy right, or any form of defamation, related to your User Content, Submitted Material or use of the website. VoteRiders reserves the right to assume the exclusive defense and control of any matter that is subject to indemnification under this section. In such case, you agree to cooperate with any reasonable requests assisting our defense of such matter. VOTERIDERS MAKES NO REPRESENTATION AS TO THE COMPLETENESS, ACCURACY OR CURRENCY OF ANY INFORMATION ON THIS WEBSITE. THE CONTENT AND INFORMATION FOUND ON THIS WEBSITE ARE PROVIDED "AS IS," WITHOUT WARRANTY OF ANY KIND, EITHER EXPRESS OR IMPLIED, INCLUDING WITHOUT LIMITATION ANY WARRANTY FOR INFORMATION OR SERVICES PROVIDED THROUGH OR IN CONNECTION WITH THIS WEBSITE OR ANY IMPLIED WARRANTY OF MERCHANTABILITY, FITNESS FOR A PARTICULAR PURPOSE, EXPECTATION OF PRIVACY OR NON-INFRINGEMENT. VOTERIDERS MAKES NO REPRESENTATION OR WARRANTY THAT ANY OF THE SERVICES WILL BE UNINTERRUPTED OR ERROR-FREE, THAT DEFECTS WILL BE CORRECTED, OR THAT THIS WEBSITE OR THE SERVER THAT MAKES IT AVAILABLE ARE FREE OF VIRUSES OR OTHER HARMFUL COMPONENTS. APPLICABLE LAW MAY NOT ALLOW THE EXCLUSION OF IMPLIED WARRANTIES, SO THE ABOVE EXCLUSION MAY NOT APPLY TO YOU. 12. Limitation of Liabilities; No Injunctive Relief. If you have a dispute with one or more users, you hereby release VoteRiders (and its owners, officers, directors, affiliates, agents, subsidiaries, joint ventures and employees) from any and all claims, demands and damages (actual and consequential) of every kind and nature, known and unknown, arising out of or in any way connected with such disputes. Identify the copyrighted work that you claim has been infringed; or if multiple works are covered by this Notice, you may provide a representative list of the copyrighted works that you claim have been infringed. While VoteRiders considers all such notices seriously, you may be liable for damages (including costs and attorneys’ fees) if you materially misrepresent that content or activity is infringing. Accordingly, if you are uncertain whether material infringes your copyrights (including whether use of copyrighted material may constitute fair use) you may wish to seek the advice of an attorney. VoteRiders may disable or bar your access to the Services and/or this website and/or may generally cease providing the Services and/or this website at any time in VoteRiders’ sole and absolute discretion. If you have questions about these Terms or the Services, please contact VoteRiders.